KOMAI Masatake (or Masayori) was one of the vassals of the Takedas and author of "Kohakusai ki" (*), historical material concerning the Takedas. 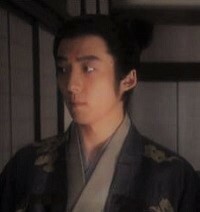 It is based on the journal of domestic affairs in the Takeda clan and also mentions YAMAMOTO Kansuke. He was one of the attendants of TAKEDA Harunobu and was promoted to his vassal when he took over the Takedas. He participated in the attack on the Takatos and negotiated with other daimyos including IMAGAWA Yoshimoto and HOJO Ujitsuna. He also negotiated with the Imperial court. He is also known as civil servant in the Takedas and was in charge of issuing many documents. Besides he drafted "Koshu Hatto Shidai", a kind of law that was applied to the territory of the Takedas in the Sengoku period. Though the years of his birth and death are unknown, he is thought to have died before 1563. In this series, he is described as a man who is bright and devotes himself to both diplomacy and domestic affairs. Besides he worries about the laziness of Harunobu in his young days at the beginning of the series. (*) Kohakusai is his sobriquet. 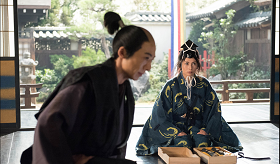 The death of Masatsugu is informed to the Iis, Natsu and her son Inosuke. Natsu feels sad but acts bravely. But Naotora shuts herself up in a room of Ryotanji Temple and continues to play go. She seems to be emotionally unstable and believes that Masatsugu is still alive and cannot remember Ryuunmaru when he visits her. 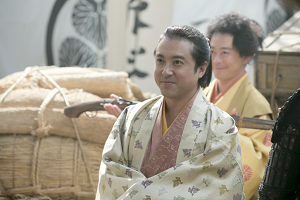 In Kiga where he lives, many people betray the Imagawas and become to yield their town to TOKUGAWA Ieyasu. But Ryuunmaru is not certain whether he is trustworthy or not. He tells his men to be ready to escape from there. Ieyasu is going to take Kakegawa Castle where IMAGAWA Ujizane is sheltered by ASAHINA Yasutomo. 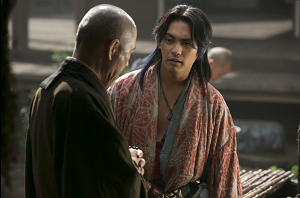 Then MATSUSHITA Jokei appears and introduces SETO Hokyu to Ieyasu. 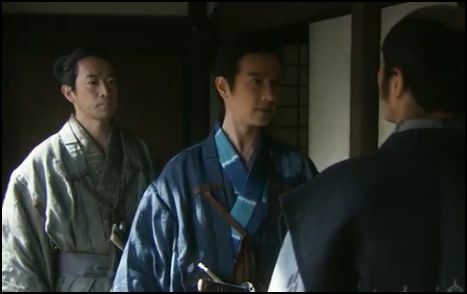 Hokyu brings military supplies to Hikima Castle where Ieyasu stays. 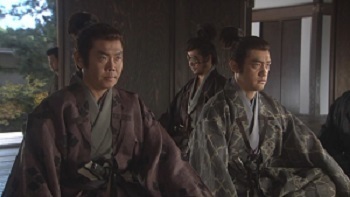 But when the New Year (1569) begins, Ieyasu is forced into a hard fight by the Hojos who support the Imagawas. Osawa Mototane, lord of Horie Castle attacks Horikawa Castle in Kiga and orders the people to resist Ieyasu. However, Ryuunmaru thinks that Mototane should not involve common people in the battle and throws him and his vassals into disorder by putting out the light in Horikawa Castle. He and his men plan to make Kiga people escape from a hidden port of the castle. There appear a group of ships of NAKAMURAYA Yodayu but the ships are requisitioned by Ieyasu because he takes the side of the Tokugawas. And the commander SAKAI Tadatsugu orders the soldiers to make a raid on them. In Ii-no-ya, Natora goes into sleep after she realised that Masatsugu has gone. She has a nightmare of killing Ryuunmaru by herself and then wakes up. At that moment, Hokyu rushes into the temple and says that there’s a raid in Kiga. 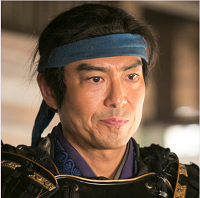 HONDA Heihachiro Tadakatsu was born in Mikawa in 1548 as the eldest son of his father Tadataka. 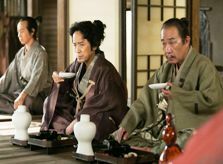 He was brought up by his uncle Tadazane after his father's death and became to serve TOKUGAWA Ieyasu, MATSUDAIRA Motonobu at that time. He participated in fifty-seven battles in his life and was never injured himself in them. He distinguished in many of them includes the Battle of Sekigahara. When ODA Nobunaga was killed in the Honnoji Incident, he advises Ieyasu who was heading to Kyoto to return to Mikawa by way of Iga, so-called Iga goe (*). After the Battle of Sekigahara, he became the lord of Kuwana Castle in Ise, current Mie. He had two sons and five daughters. One of his daughters was called Ina (Komatsu hime) and married SANADA Nobuyuki. And his spear called Tonbokiri is one of the Three Great Spears of Japan. In this series. he is described as a man who is loyal to Ieyasu and supports him together with other vassals as SAKAI Tadatsugu and ISHIKAWA Kazumasa. (*) Because Iga is mountainous and the it's hard to capture or kill them there. And local samurais in the province assumed an attitude to protect Ieyasu. Suo (su-ô) was worn by the samrais in the Middle Ages. Even in the late Sengoku period, it was popular in the provinces. Suo is a suit of kimono (suo) and hakama and both are made of linen. Unlike kosode, it has big sleeve openings and and is tucked into hakama to make the wearer move easier. Leather cord at the front is decoration. Suo was also worn with nagabakama (trained hakama) as ceremonial dress.